Bizagi Studio presents a friendly Deployment Wizard to publish the project's processes in a quick online procedure. This procedure is assisted by the Process Wizard, in which one-click configurations are carried out. A deployment's configuration involves: selecting which versions of which processes are to be deployed, and then, choosing the target environment (Test or Production), along with other specific options for each environment. One-Click Deployment automatically creates (in the first deployment) the target environment's components (Work Portal, database and Scheduler service). For further deployments, One-Click Deployment updates the target environment with new information. This feature is not eligible for Automation Service. For more information about this tool, refer to the Advanced Deployment. •The option to export and import processes directly in the cloud, under a similar UI and approach as the one presented by the Advanced Deployment Tool. The options related to objects involved in process deployment in One-Click Deployment are also available when either exporting to Automation Service or using the Advanced Deployment Tool. 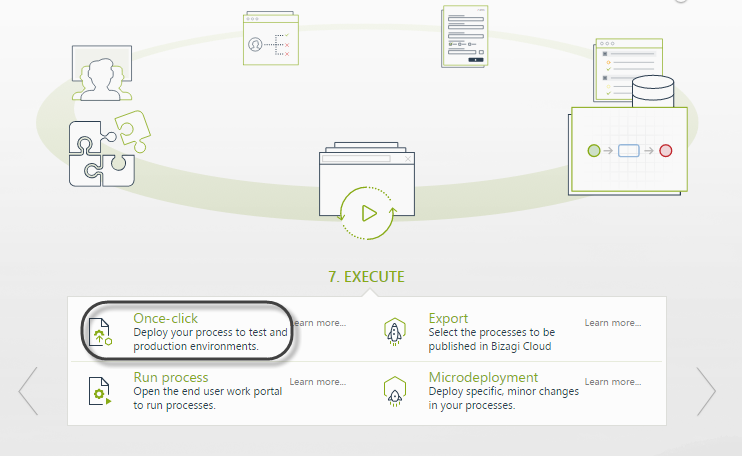 Execute One-Click Deployment is through Bizagi Studio. Launch it from Step 7 of the Process Wizard (the Execute option) by selecting the Deploy Process option. This option becomes available once there is at least one Process for which you have clicked the Next option in Step 6. Alternatively, the deployment window and procedure can be also launched from the Process module (in the Expert View) by right-clicking on a specific Process version. What happens with the existing cases? When a deployment is executed by Bizagi, existing cases of Processes in the Development environment are not taken to the Production or Test environment. Bizagi does not deploy values stored in master entities. •If a new Process version is deployed to Production, the existing cases will continue to work with the version they were created with. •New cases created in Production on will be created under the latest deployed Process version. You may also make minor changes to a Process which is already in Production (and have the existing cases adopt those changes). For this scenario (e.g adding a new attribute, modifying a business rule or a performer assignment), you must modify the current Process version and publish this version again to the Production. How to do a deployment? Deployment of Bizagi Processes should be done after making sure all prerequisites have been satisfied, and by following the recommended deployment cycle. To review the prerequisites for a deployment of your Bizagi project, refer to Previous considerations and requirements. 1. 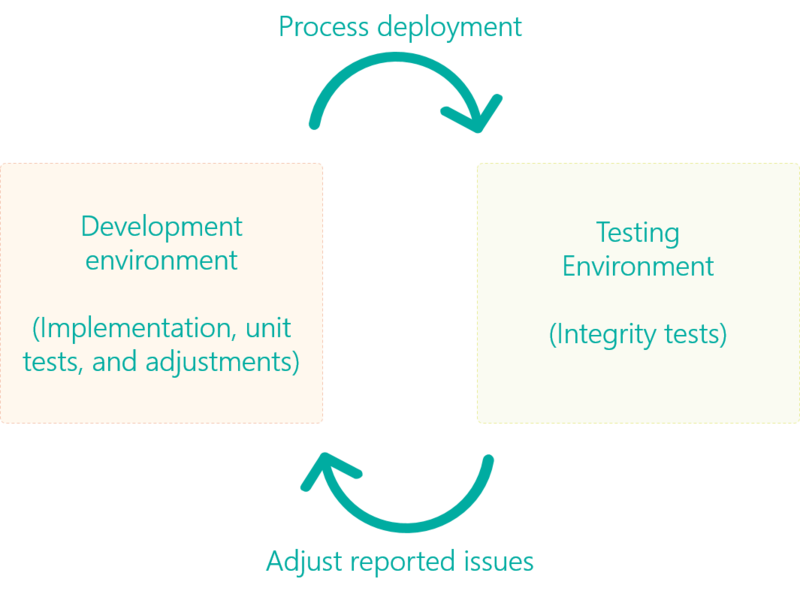 First, deployments to the Test environment are made in an iterative way so that required additions and modifications are detected in the Test environment and the code can be adjusted in the Development environment. In the Development environment you can also perform quick prototyping, workflow verification and unit tests. Perform these iterations without marking the version as a Release Candidate until it passes all unit tests in the Test environment. 2. 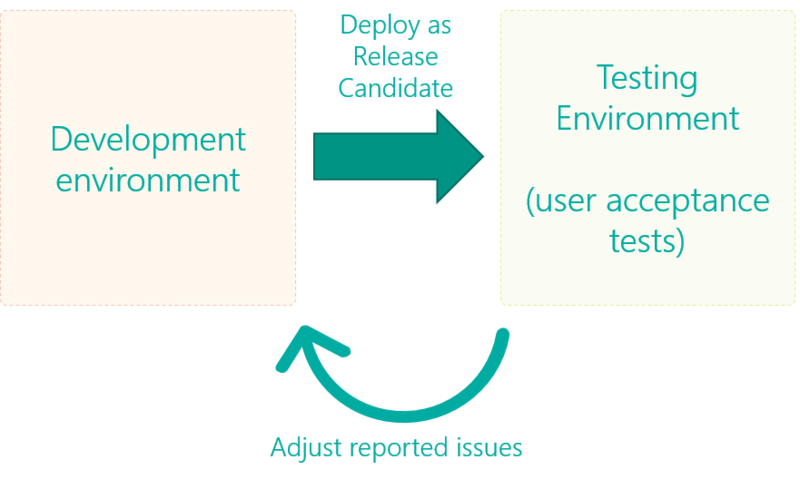 When there are no more adjustments to be made to what was observed in the tests carried out in the Test environment, you can deploy to the Test environment by specifying the process versions that are to be marked as Release Candidate. If adjustments are required, you have to cancel the Release Candidate, perform the adjustments in the Development environment, and start again. 3. Once the Release Candidate Process versions have satisfactory test results and are approved you can apply the Release Candidate to the Production environment. 4. Subsequent deployments for continuous improvement of the existing Processes, or to publish new Processes, should follow the same process. Click for more information about Continuous improvement and development after a deployment. We strongly recommend that you perform deployments to a Test environment prior to deployments to the Production environment. Use a Test environment with similar characteristics of the Production environment, so that user acceptance tests can certify that the Processes are ready (their behavior, integration points and Workflows are as expected) to be taken to a Production environment. Click for more information about the Deployment to the Test environment and detailed explanation about the Release Candidate option. Once process versions in the Development environment do not need further additions or modifications, you may deploy your Processes to the Production environment. Click for more information about the Deployment to the Production environment.